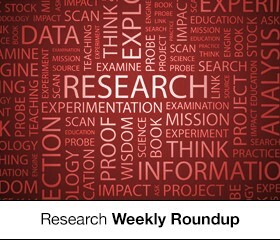 ExchangeWire Research’s weekly roundup brings you up-to-date research findings from around the world, with additional insight provided by Rebecca Muir, head of research and analysis, ExchangeWire. In this week’s edition: more money spent on audience data; digital drives global ad spend; and mobile conversion rates on the rise. Between Q4 2014 and Q4 2015, the amount of money spent on audience data has increased by 154% in Europe. That is the conclusion of Eyeota’s first Annual Index. The audience data provider has identified the data trends based on their agency clients’ campaigns utilising Eyeota’s profiles across 60 countries. The three top-selling sectors, both in Europe and in the UK, are Finance, Automotive, and Electronics & Computers. Staying in the UK, finance advertisers particularly targeted niche sociodemographic profiles, i.e. users interested in real estate, investments, financial services, or mortgages. Electronics & Computers’ advertisers nearly tripled their spend in audience data from Q4 2014 to Q4 2015 – a general global trend. In the UK, advertisers invested primarily in B2B data in order to reach IT decision makers, the study found. Overall, 63% of all data purchased in the UK was sociodemographic. Digital will account for 27% of global advertising spend in 2016, a study by Carat reveals. By 2017, digital may already make up almost one-third of the global ad spend (29.3%), amounting to USD$161bn (£115bn). This growth in ad spend is attributed to the general surge experienced by mobile advertising (37.9% growth), online video advertising (34.7%) and social media advertising (29.8%). Looking back on 2015, the Carat study reveals that advertising increased in all regions, with Western Europe experiencing the lowest growth rate of 2.8%, North America at 4.3%, APAC at 3.6%, while LATAM had the strongest growth with 11%. 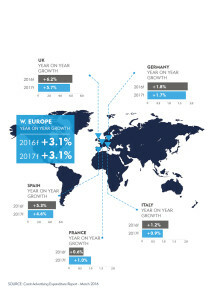 Focussing on Western Europe, the study reveals the markets with the highest growth predictions this year: the UK (6.2%), Spain (5.3%), Sweden (4.8%), and Ireland (7.5%). Markets with lower growth in 2016 include France (0.6%), Switzerland (0.5%), and Norway (0.2%). By the end of 2016, ad spend in the region is expected to reach USD$91.9bn (£65.4bn), accounting for a 17.1% share of global advertising expenditure. The Western European growth can be mainly attributed to growth in the UK and Spanish markets, the study finds. Advertising spend in the region is expected to continue growing consistently at an estimated 3.1% in 2016 and 2017. Carat’s ad spend forecasts are compiled from data which is collated from around the Carat network. Ad spend is increasingly being moved to smartphones and mobiles, following the consumers who are now spending more time and attention on mobile devices than desktop. This is reflected in mobile’s share of spend, which grew almost 50% from 33% to now almost half of all budgets, the Marin Global Online Advertising Index claims. Drilling into their data, Marin found that mobile conversion rates grew across search, social, and display, with social the big winner at 51.2% growth. Search conversion rates on mobile grew 32.9%, and display garnered 34.7% growth. 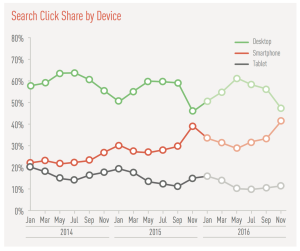 Smartphones continue to experience growth in click share: from 22% of global search clicks to 35%, which amounts to an almost 55% growth year-on-year. Display ad clicks were particularly strong on smartphones, too, a trend that is set to continue: by the end of 2015, 71% of all display ad clicks were on a smartphone. For 2016, the study expects the share of smartphone among display ad clicks to reach 77% of total display ad clicks.